Do you remember that old song? "Daisy, Daisy, tell me your answer do - I'm half crazy all for the love of you." 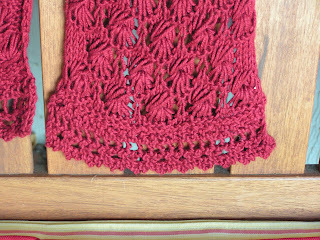 Well last Sunday I got a special treat and Mom and I went to take a class at Knitting Arts in Saratoga on the Daisy scarf. Now we had been there before and seen this gorgeous scarf. We even bought yarn for it and got the pattern. So when I saw that they were offering a class my first thought was, "we don't need that - we have the pattern." But then I thought there must be some reason they were actually offering a class on the scarf. Well now I know why! There are some seriously weird stitches in that pattern. Purling and wrapping the yarn 3 times each. Then letting all the extra wraps go and knitting, purling, knitting, purling and knitting ALL IN TO THE SAME STITCH! And if that's not enough you wrap 3 times with each of those 5 stitches!!! Well I think the song shoud be, "Daisy, Daisy, what am I going to do? I'm half crazy trying to knit on you." We finally got it though and are starting to make progress. 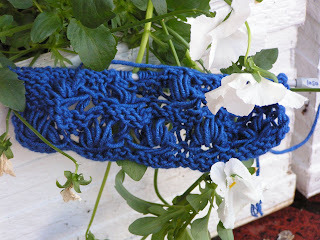 The interesting part is how different it looks depending on your yarn. My Mom is using Classic Elite Posh which is fabulous yarn that is 70% silk and 30% cashmere. That's the yarn the store used for their sample. I decided to use Blue Sky Alpaca. It's the first time I've used Blue Sky and it is wonderful but it's probably a bit too thin for this pattern. 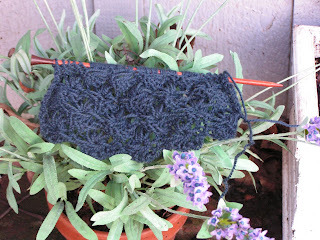 It is giving it a very pretty lacy look though! The top photo is Mom's scarf, the middle is mine and the red is the store's sample. The bottom is an edge that you knit at the end and attach. It's pretty cool too because it is knit long and skinny and then turned to sew it on. Very pretty scarf but looks complicated. 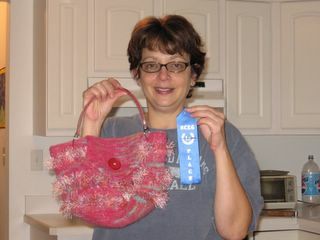 Nice to share the fun and love of knitting with your mom! How fun! Very nice looking scarf/pattern. I am thrilled that Full Thread Ahead is a vendor at Stitches West!! I was going to take Julie to the store, maybe I still will do that - just to show her downtown and where I went to HS, etc. etc. See ya this coming weekend! !